Unni Mukundan (Sreenivasan) is an academic who wants to make a film. Or rather, he has written a script that he wants made into a film by the well-known director David Paul (Lal Jose). And so one day when their paths cross by chance, he grabs the opportunity to narrate his story to the stalwart. Mukundan’s imagination transports Paul away from their meeting place to the town of Payyanur in Kerala’s Kannur district where Amal (Asaf Ali) is battling heartbreak. His girlfriend has ditched him to marry a man her family considers a better prospect, and Amal decides to get a fresh start in life. 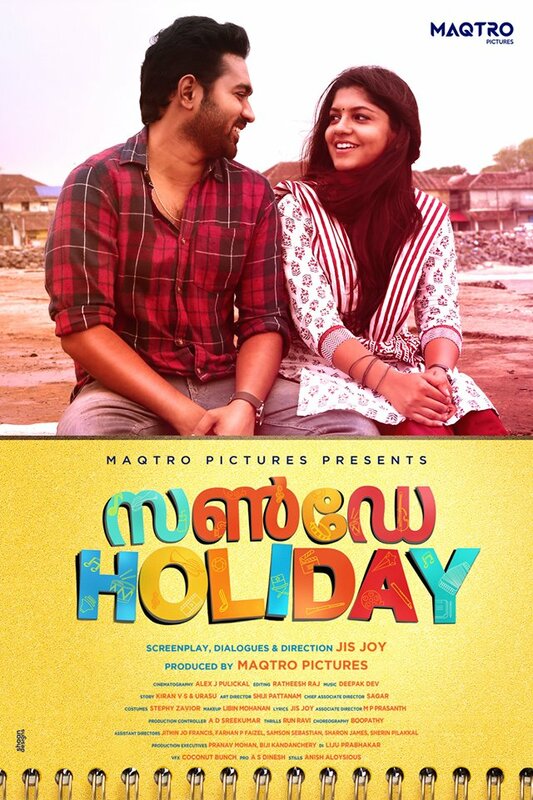 He relocates to work as a door-to-door salesperson elsewhere and encounters a motley bunch of new characters, among them a spunky fellow salesperson (played by Aparna Balamurali) who is more than she appears to be; an aspiring actor (Dharmajan Bolgatty) who sustains himself for now doing small-time ads; a writer of tacky dialogues and lyrics for the Malayalam dubbing of Telugu blockbusters (Siddique); and a man desperate to avenge his father’s betrayal at the hands of a treacherous business partner (Sudheer Karamana). Sunday Holiday – directed by Jis Joy who earlier made 2013’s Bicycle Thieves – is clearly designed as slice-of-life cinema. In keeping with that ambition, it gets its tone right in large parts. The storytelling style is natural and realistic until the director’s faith in his chosen genre falters glaringly when he needlessly inserts a nightclub song-and-dance into the proceedings, no doubt to give Asif Ali an opportunity to show off his dancing skills and possibly to appease viewers with a taste for formulae. The result of that jarring passage is a break in the flow of the narrative. The film’s multiple characters are projected as ordinary people, but each in their own way is not. The pain of a jilted lover is no less agonising to him just because he happens to be a non-entity to you and me. A professionally ambitious woman living alone in a conservative community is no less a heroine than the Manju Warriers and Nayantharas of the world in their on- and off-screen avatars. Sunday Holiday then is about the extraordinariness in everydayness. Malayalam cinema has been delivering a string of on-point films of this nature, with last year’s Maheshinte Prathikaaram and the current rage, Thondimuthalum Driksakshiyum, being among the highlights of the lot. To have been a contender to their crown, Sunday Holiday needed stronger writing. While it has its basics in place, once the initial charm wears off, it is hard to ignore the fact that it lacks flesh and depth. On the plus side, Mukundan’s narration is never stretched so long as to take away from the pull of Amal’s story – the (primary) film within this film – but on the downside, his ‘secret’, revealed in the end, is a needless addition to the plot and one that is almost silly. Let us not mistake superficiality for simplicity, and loose ends for an open ending. Sunday Holiday does. Too often. A murderous attack on a significant character, for instance, is left casually unreported to the police. One of the characters gets away with a heist that is massive in his circumstances – while the manner in which that happens is not entirely impossible, what defies believability is that family members of the culprit, who are presented as decent folk, do not bat an eyelid when they discover his crime. And several characters fail to rise above a single defining characteristic. The cast is packed with talented character artistes. Leading man Asif Ali is likeable as always but is yet to develop the charisma to carry the weight of an entire film on his shoulders. Aparna Balamurali, on the other hand, looks like she might, if only male-centric Mollywood would give her a chance. This youngster, who shone in supporting roles in Maheshinte Prathikaaram and Oru Muthassi Gadha last year, has the words “star material” written all over her, and deserves to be seen in films revolving around the character she plays. As Anu, Balamurali lifts Sunday Holiday each time she appears on screen. If there was more of her in the film, it might even have been saved from its intermittent blandness. That blandness arises largely from an overall lack of novelty. The traitorous female lover, the hapless male lover and all-male drinking sessions – familiar motifs from a vast majority of Malayalam films – play a substantial role here. They are a reminder of the extreme gender segregation in Kerala society and the anti-women prejudice that is its direct consequence – but these are unintentional insights (and the fact that they are unintentional on the part of Joy and so many other directors, including some seemingly progressive ones, just goes to show how deep-rooted these problems are). That said, while Sunday Holiday offers little that is new, the good thing is that it is unpretentious. It is sometimes sweet, more often flat, at no point insufferable but never earth-shattering either. Having seen it once, I’d say it is watchable but thoroughly forgettable fare.